This auction description appeared in the catalog for Bonhams annual all-Ferrari auction at the Palace Hotel in Gstaad, Switzerland, December 20, 2002. 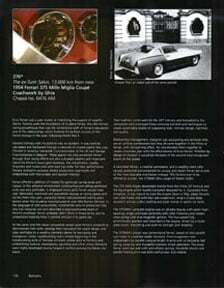 Images of the catalog pages are used with permission and the contents are © 2002 by the author and Bonhams. Enzo Ferrari was a past master at mobilizing the support of wealthy patrons. Patrons were the foundation of Scuderia Ferrari, the Alfa Romeo racing powerhouse that was the foundation both of Ferrari’s reputation and of the relationships which fostered the brilliant success of the Ferrari marque in the years following World War II. Ferrari’s relationship with his patrons was no accident. It was carefully calculated and facilitated through a network of trusted agents like Luigi Chinetti in America, Maranello Concessionaires in the UK and Garage Francorchamps in Belgium. Ferrari’s agents not only promoted Ferrari through their racing efforts but also cultivated the wealthy and important clients for Ferrari’s luxury gran turismos, the industrialists, royalty, financiers and movie stars who paid top dollar for high performance Ferraris clothed in exclusive limited production coachwork and embellished with fashionable and opulent interiors. Ferrari offered a plethora of models for particular racing series and classes. In this artisanal environment constructing and selling additional units was very profitable. It employed many parts Ferrari would have cast, fabricated, machined and assembled anyway as racing spares and turned them into cash, a practice Ferrari had pioneered twenty years before when the Scuderia manufactured its own Alfa Romeo Monzas. In the language of cost accountants, incremental units of production had very low marginal cost and absorbed a disproportionate share of Ferrari’s overhead. Ferrari probably didn’t think in those terms, but he understood implicitly how it worked and put it to good use. At the same time the Italian carrozzeria seized upon Ferrari’s products to demonstrate their skills, develop their reputation for stylish design and cater profitably to a wealthy clientele’s desire for exclusivity and indulgence. Italian coachbuilding had a simple beginning in the metalworking skills of Torinese armorers whose skills at forming and embellishing barbuts, breastplates, gauntlets and other armor elements were highly developed during frequent conflicts among the Italian city-states. Their tradition continued into the 20th Century and translated to the carrozziere who employed these centuries-old skills and techniques to create automobile bodies of surpassing style, intricate design, lightness and quality. Relationship management, marginal cost accounting and armorial skills are an unlikely combination but they all came together in the Fifties at Ferrari, with far-reaching effect. No one blended them together to create a business plan with the effectiveness of Enzo Ferrari. Whether by design or intuition it would be the basis of the second most recognized brand on the planet. A race-bred Ferrari, a creative carrozzeria, and a wealthy client who valued, protected and preserved his unique and stylish Ferrari led to one of the most desirable and original Ferraris ever to be offered at auction, the 375 MM Ghia coupé of Robert Wilke. The 375 Mille Miglia descended directly from the 4½ liter GP formula and the big engine which Aurelio Lampredi designed for it. Successful from inception, it was natural to tune the engine down a little, adapt Ferrari’s two-tube frame and solid rear axle suspension, wrap a 2-seat body around it and go collect starting and prize money in sports car races. 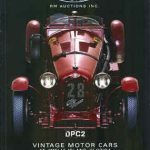 The 375 MM’s Lampredi engine was an all-alloy beauty with seven main bearings, single overhead camshafts with roller followers and hairpin valve springs and dual magneto ignition. The four-speed fully synchronized gearbox was mounted to the engine, driven by a multi-plate clutch. Everything was built for strength and reliability. The 375 MM’s chassis was conventional Ferrari, based on two parallel oval tubes in a welded ladder structure. Front suspension was independent by parallel unequal length A-arms with a transverse leaf spring, sway bar and Houdaille hydraulic shock absorbers. The usual Ferrari solid rear axle with semi-elliptic springs, Houdaille shocks and parallel trailing arms was both well-proven and reliable. As its name suggests, the 375 Mille Miglia was intended for the open roads and high speed circuits of European races. 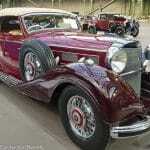 Predictable handling, robust construction and long, long legs were its attributes. The 375 MM was one of the most prolific of Ferrari’s early models and they are today among the most important and coveted of Ferrari’s classic Fifties sports-racers. Twenty-six were bodied by Pinin Farina in either berlinetta or spyder configuration, spartan and consistently successful racing cars. Three other 375 MMs were exceptionally special cars, even among the great Ferraris of the Fifties. 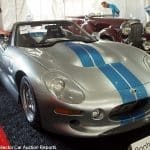 They are extravagant, luxurious and unique high performance automobiles that have a mystique that both was appreciated by their early owners and has been perpetuated by subsequent custodians. Their patrons’ names alone set them apart: Ingrid Bergman, the King of Belgium and Robert Wilke, himself patron of the Indianapolis 500-winning Leader Card Specials. 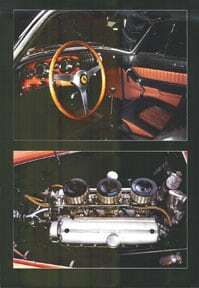 Only Wilke’s Ferrari 375 MMs was bodied by Ghia, one of the oldest and most accomplished of the Italian carrozzeria. 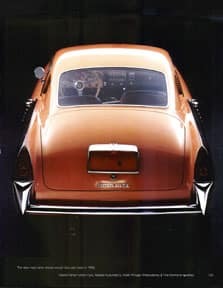 Ghia was established in 1918 by Giacinto Ghia and quickly established a reputation, and commercial success, constructing luxurious and stylish coachwork for the deluxe chassis of the day. Following Giacinto Ghia’s death in 1944 Giorgio Alberti and Felice Mario Boano took control of Ghia, later bringing Luigi Segre on board from SIATA. 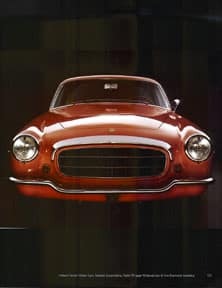 Boano led Ghia to establish relationships with American manufacturers early in the Fifties and exposed Ghia’s designers to developing trends in the US, particularly at Chrysler where Chrysler President K.T. Keller and designer Virgil Exner employed Ghia’s skills to refine, interpret and construct a series of Chrysler show and concept cars and prototypes. 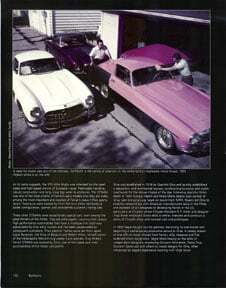 In 1953 Segre bought out his partners, becoming its sole owner and beginning a tremendously productive period at Ghia. A steady stream of one-offs on Italian chassis from Ferrari, Alfa, Maserati and Fiat widened Ghia’s recognition. 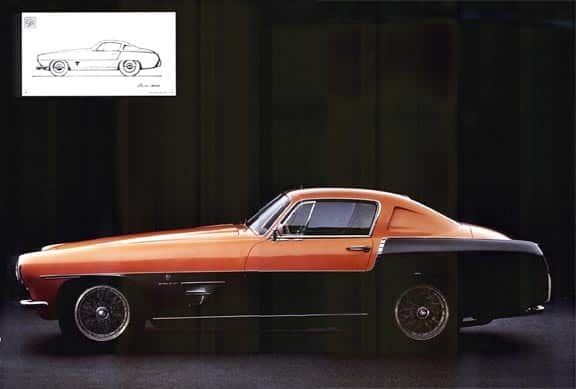 Segre relied heavily on the skills of independent designers, employing Giovanni Michelotti, Pietro Frua, Giovanni Savonuzzi and others to create designs for Ghia, often influenced by Segre’s experience working with Virgil Exner. Ghia did not shy away from extremes during this period, particularly in its work with aerodynamics and in 1955 an extraordinary example appeared on Ghia’s stand at the Turin Motor Show, the dart-like Gilda. 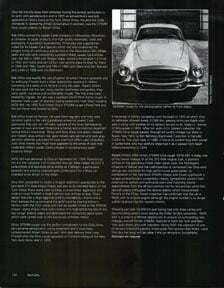 Alongside it, appearing almost conservative in contrast, was the 375 MM Ghia coupé ordered by Robert Wilke. Bob Wilke owned the Leader Cards company in Milwaukee, Wisconsin, a converter of paper products into high quality envelopes, cards and packaging. A successful businessman, Wilke also was a sportsman noted for his Leader Card Specials which not only established the longest string of continuous sponsorship at the Indianapolis 500, fifteen years, but also were consistently successful there. Leader Card entries won the 500 in 1959 with Rodger Ward, scored a remarkable 1-2 finish in 1962 with Ward and Len Sutton, two second place finishes for Ward in 1960 and 1964, fourth and fifth in 1963 with Ward and Don Branson and a fifth in 1958 with Jim Rathmann. Bob Wilke was exactly the sort of patron to whom Ferraris appealed and he and Luigi Chinetti built a close relationship resulting in Wilke’s ownership of a series of six Ferraris in only ten years. Robert Wilke’s Ferraris were not the fast, noisy, spartan berlinettas and spyders, they were stylish, luxurious and comfortable coupés. The first three were bodied by Vignale, the last was a standard 250 GT Pinin Farina coupé. In between were a pair of dramatic styling statements from Ghia including 0476 AM, the 1955 Turin Motor Show 375 MM coupé offered here. Bob Wilke loved his Ferraris. 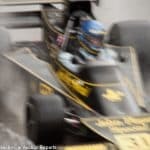 He used them regularly and they were common sights in the racing paddocks where his Leader Card-sponsored Indy cars ran. All were, typically of the time, flamboyantly painted in two- and even three-tone schemes and sometimes repainted during Wilke’s ownership. Yellow and blue, black and green, maroon and metallic gray, brilliant red, gold metallic and salmon and dark gray are color schemes calculated to have maximum effect upon onlookers, auto show liveries that must have appealed to the sense of style that made Bob Wilke’s Leader Cards a leader in contemporary paper products design. 0476 AM was delivered to Ghia on November 24, 1954. Powered by the 4.5 liter Lampredi V12 it breathed through three Weber 42 DCZ 3 carburetors and delivered some 340hp at 7,000rpm, a particularly powerful and exciting chassis/engine combination for a show car intended to be driven on the street. Ghia then proceeded to create a singular statement appropriate to the race-bred 375 Mille Miglia chassis and also to its intended debut on the Turin Motor Show stand next to Gilda, a streamlined, aggressive and original coupé finished in bright salmon over anthracite gray. Ghia’s design featured a large eggcrate grille surrounded by chrome and a front bumper that accentuated the grille’s size by dipping below it. Vents in both the front fenders and roof sail panels hinted at the 375 MM chassis’ racing origins while bold chrome trim highlighted the top of the rear fenders’ leading edges and delineated the contrasting paint colors which were carried over to the luxuriously trimmed interior. Ghia’s 375 MM coupé was the perfect complement to the Gilda show car’s extreme aerodynamic styling statement and it must have complemented Robert Wilke as well, who took delivery from Luigi Chinetti after the Ghia coupé appeared in Chinetti’s display at the New York Auto Show later in 1955. 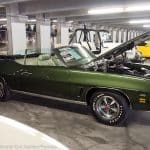 It remained in Wilke’s ownership until his death in 1970 at which time its odometer showed barely 12,000 kilometers, passing to his son Ralph who sold it along with another of his father’s Ferraris to Dr. Robert E. Steiner of Milwaukee in 1974. After ten years in Dr. Steiner’s collection the 375 MM Ghia coupé passed, through Ed Jurist’s Vintage Car Store in Nyack, New York, to Ken Behring’s Blackhawk Collection in Danville, California. 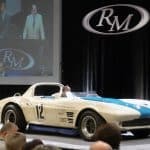 Two years later, in 1986, it found its current long term owner in Switzerland who has carefully preserved it exactly as it passed from Ralph Wilke’s ownership in 1974. Showing just over 13,000 kilometers and having had only three caring and discriminating owners since leaving the Wilke family’s ownership, 0476 AM is a once in a lifetime opportunity to acquire an outstanding, original, one-off Ferrari 375 MM, featured at both the Turin and New York auto shows and with unbroken history from the collection of one of Ferrari’s important patrons, Indianapolis 500 sponsor Bob Wilkie. 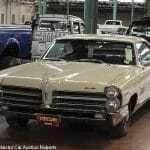 Click here to return to the Auction Catalog Descriptions index page.